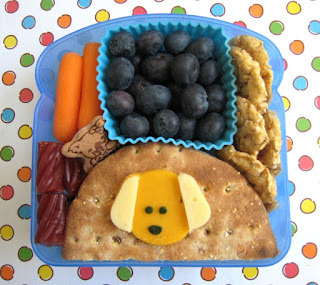 F&B needed lunch today, so we decided to go with a puppy theme, times 2. The gorgeous Dallas weather seems to have provoked allergies in me, so the simpler, the better today! 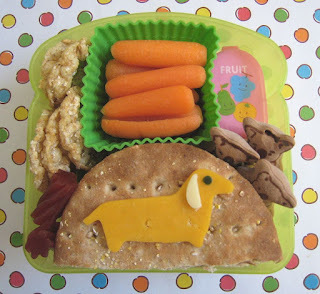 I opted to use the sandwich style boxes again, to show how much food they can really hold, as well as how perfect they can be for a started bento. All we needed to add was a water bottle and it's a complete lunch! Ben had a cream cheese and jelly sandwich on multigrain rounds, cut in half and stacked on top of each other. It's topped with a happy puppy face (orange cheddar, white cheddar ears and cucumber features). To the top is a silicone muffin liner filled with blueberries, to the right a few blueberry-pomegranate crisps, and to the left, carrots, a couple of koala cookies and a couple of red licorice bits as a treat (so yummy, review coming soon)! Faith has a salami and cheese sandwich, also on multigrain, cut in half and stacked, but topped with a cheddar dachshund. White cheddar makes the ears and a bit of cucumber for the eyes. Since we are low on fruit she likes, she has a lot more carrots, along with a container of ranch, some crisps, koala cookies and licorice bits as treats. What? No COLLIES??? For shame. Those are really cute! Love the weiner dog! I can't find koala cookies anywhere! May have to try Amazon. 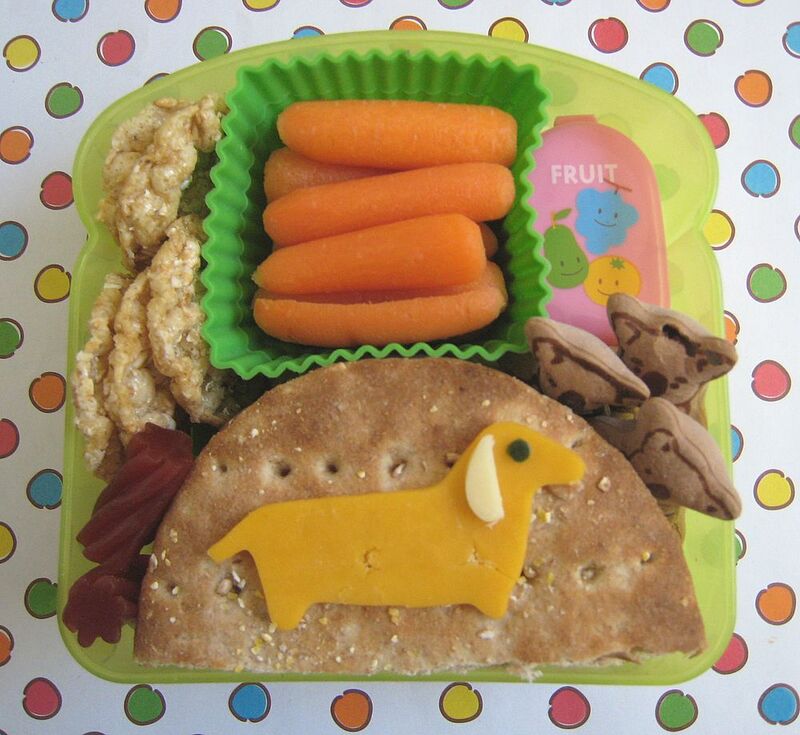 Super cute bentos!! I love the simplicity of the puppies. We'll see what we come up with today - thanks for the inspiration.